Blog of Swine: Turn capitalism into fighting its ailments! With piggies! Turn capitalism into fighting its ailments! With piggies! CharityUSA.com has a number of sites that raise funds to fight against hunger, breast cancer and animal abuse, and for child health and rainforest conservation. The fundraising is done on one hand by the "one click per day" principle - if you click a certain link, you will be taken to a page with ads by sponsors who fund for example mammograms. On the other hand they sell all kinds of merchandise, and part of the revenue goes to fund for example food aid. Capitalism can be viewed as a culprit in some of the ailments these projects are alleviating - in a socialist state, for example, healthcare and literacy would be funded by the state, highly prioritized and freely available to all citizens, while in a market economy you can much more easily fall out of the system and not get any healthcare and education if you don't have the money to pay for it (yours truly lives in a market economy and cannot afford healthcare at the moment). Still, I guess this is a pretty clever way to use capitalist tools (advertising, consumption) for the common good. 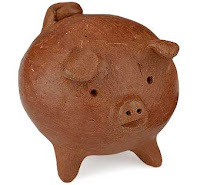 If you buy a hand made clay piggy from Chile (where they say three-legged clay pigs bring luck!) 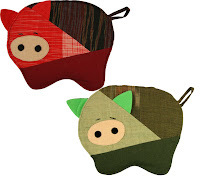 or one of these likewise hand made piggy potholders from Thailand (made by a cooperative of retired art techers), each of the piggies purchased will fund 25 cups of food for people in need. 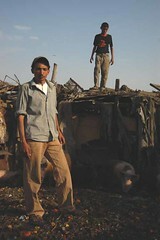 You can even fund a non-profit microloan for a pig in Guatemala.